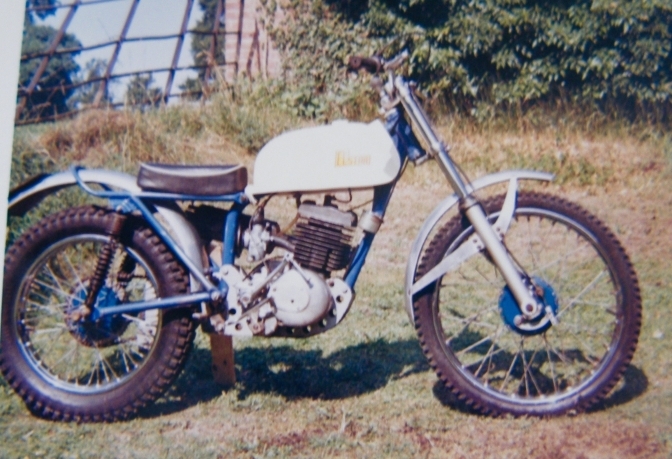 Elstar Motorcycles was the creation of Alf Ellis from Smethwick UK grass track and speedway bikes were the first machines produced later a trials bike was introduced. 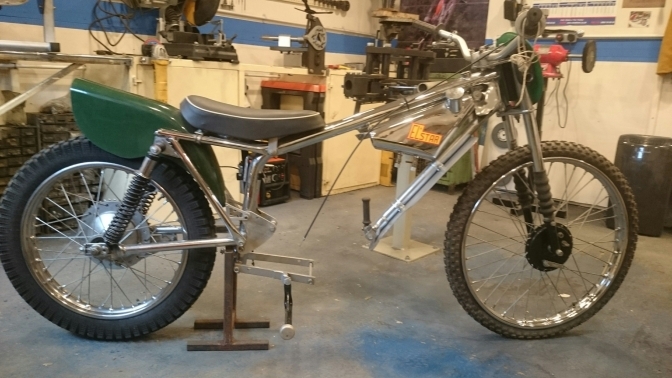 This is the newly refurbished Elstar trials bike to the original specification. what a brilliant job Bob has made. Roger Gardner and Mick Bennett admire Bob's superb recreated Original Elstar.2018. IOM Manx two Days Trial. Photo Courtesy Roger Gardner, NZ. And After the Manx Two Day. Roger's Story further down the page. Here is the Mick Bennett owned ELstar, the one purchashed from Bunny Ward. Thanks again Roger and Mick for sending the photo. This breed was the brainchild of Alf Ellis a first class engineer and shrewd businessman. Little publicity was given to the mark , most were sold on the quality, and service you received from Elstar. This was the engine unit that he fitted to his first grass-track machines, and they did become Stars in there own right, and grass trackers at the time in the early sixties clambered to buy one of these machines. So the business Elstar Motorcycles took off. 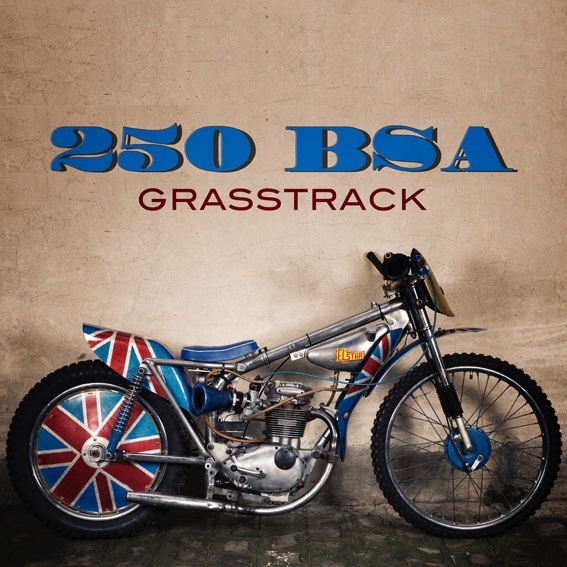 Elstar 250 BSA B25 engined Grass bike. Philippe would like to know the 928 carb jetting for Methanol if anyone knows it. 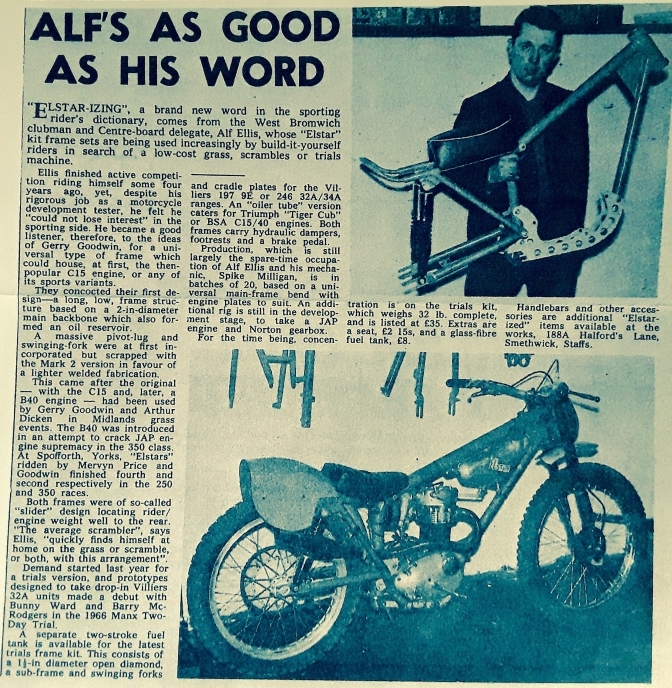 By 1965 Alf had decided he wanted to build a trials bike, so set too, and built the frame in two weeks. He needed a rider for the thing so rang up Bob Cooper from the Stratford Club. Alf said he had not got a motor for the ELstar and needed to buy one for the machine, A Villiers 37 A lump. Bob suggested that if he had the works James ,Villiers motor sat in a bike, that no one seemed to want, why didn't he use this engine has he knew it was good, and had been tuned to his liking. So Bob fitted the motor into the New Blue ELstar Kit, he was amazed at how good the machine was. 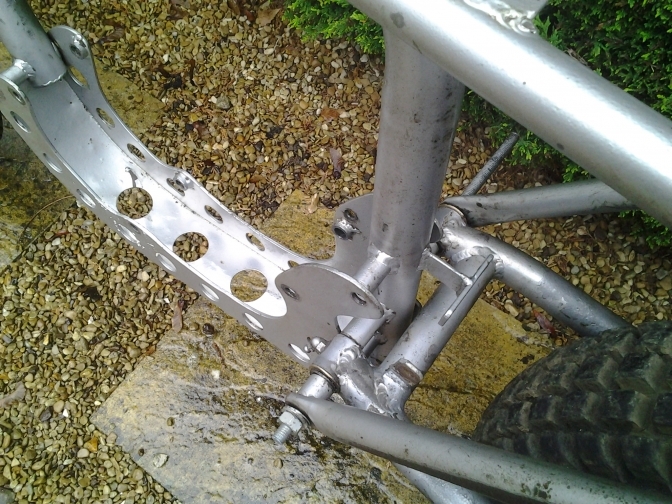 After the run out in the first trial on the machine Bob found a small crack under the steering head on the frame,when cleaning the bike, but it was left untouched, as it was not structural. This is where I first saw the machine at Edgehill Quarries,in Warwickshire. And I was really amazed at how good a design it was, with its simplicity. What I really liked was the way the rear wheel plates were made and welded to the swinging arm. Just a simple bend of flat steel. I copied this method later on a re framed Ex Rodney Gould BSA Gold Star, because the idea was so good. Here above you can see what I mean about the method of joining the wheel plate, to the swinging arm. 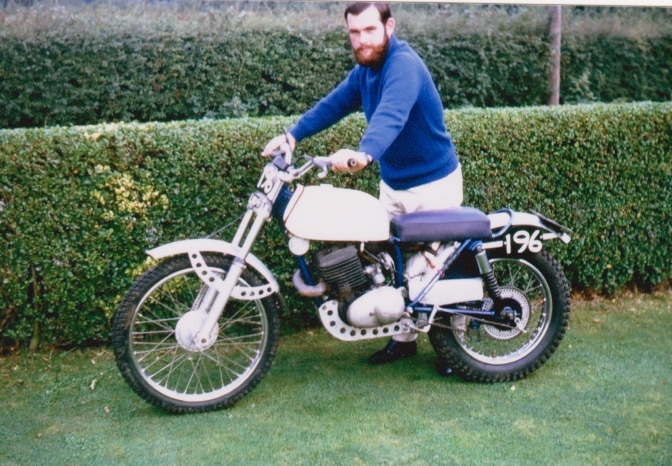 Bob Said at the time, that it was the best trials bike that he had ridden, and the bike would find grip where nothing else would, and he also loved the way the Ceriani forks fitted worked,with the six inches of movement. Scottish Six Days. in 1966. After the first day in Scotland Alf got an urgent phone call from Sam saying the frame had cracked. 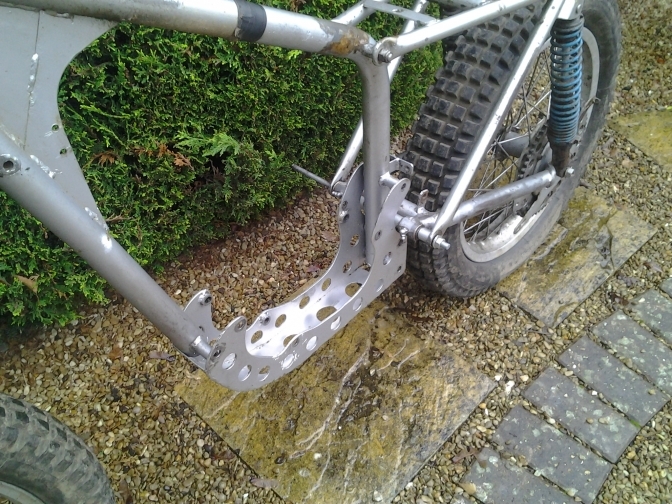 So Alf fabricated a clamp bracket and then drove all the way from Smethwick to Scotland to fit it, the bike then lasted out the week. 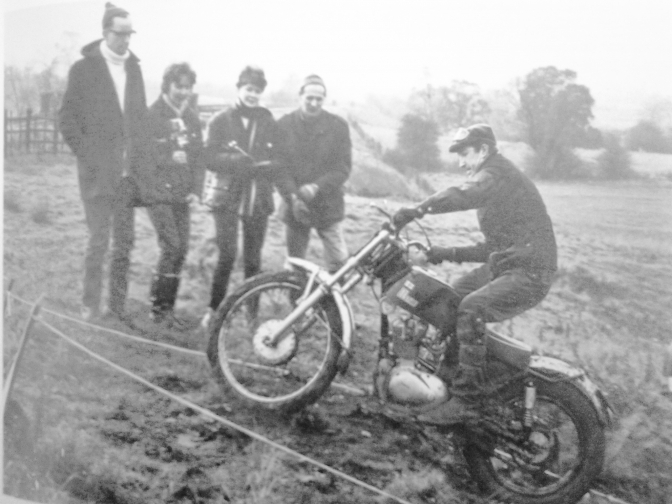 Bob said that he could not see how a man like Alf Ellis with no experience of building trials machines, could in a two week period build a bike, that was so good, when other parts of the motorcycle industry built them so badly, with the years of experience they all had. 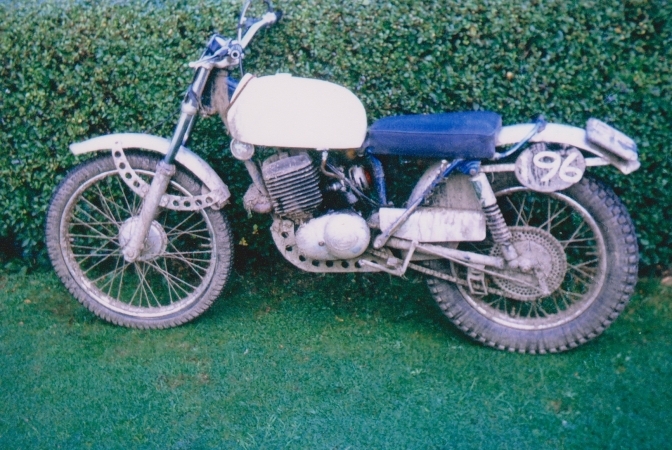 Unfortunately there were not that many ELstar Trials machines made, there were the Grass and Speedway bikes to come first, and then when Alf had got a steady flow of Trials frame kits going through the door. He had his fatal car accident. and production came to an abrupt end, over night. Just thought it might be of interest to you that I was working for Alf in the garages at the back of his house in West Brom when he had his car crash. Seem to remember it was an old Opel Car. He was always nodding off behind the wheel and had many scrapes whilst driving, I carried on working for a few days to re assemble a customers Vincent we were working on. I had to make new bearings on the lathe for the big end. That was my redundancy pay lol. We used to go to the pub a few doors down from his house for dinner and there was another guy who worked with us. Can’t remember his name. He lived at the back of Alfs house somewhere, he was a diabetic! Long long time ago👍😊 I am 66 now. I was about 18 then. Charlie ~Oo>Thanks Peter another jem that adds to the story. And another update from Bob. And we keep getting more information. Hi Charlie It's been quite a while since I last spoke to you, the hold up with the Elstar project was the tank, it took 6 months, which was hugely frustrating, but we finally got it back, and I've got to say it was worth the wait, Roger Inn has made a fantastic job, so the bike is finished apart from the tank bung, which is being turned now. 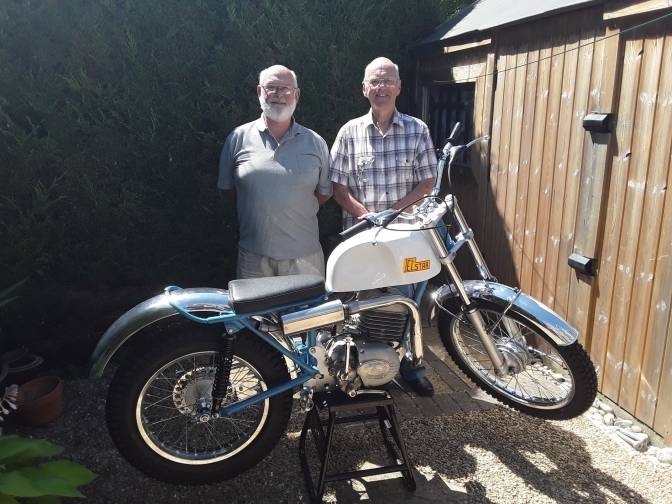 Roger Gardner, who was in the UK on holiday, and his long time friend and old riding partner Mick Bennett, they cast a critical eye over the bike, I'm pleased to say that the comments were very positive. Mick let me have some press clippings from his scrap book, one in particular was an article about Alfred Ellis with a picture of him holding a trials frame, it also threw up another name, that of Alfs mechanic Spike Milligan, yes I had to double check that name too. Good explanation of the Elstar story. And at least one image of the man himself.Thanks Mick. Sam's wife Eileen and her father are the spectators. And perhaps we should hope Mr Milligan will get in touch again. Important New Information has come to light. replacing.In the mid sixties I was a Toolmakers apprentice with little money & lots of enthusiasm. my time as an apprentice & had some extra cash. Bunny Ward had an Elstar, but had to sell it because he worked for the Greeves agent. who lived close to the Coopers. Both Sam & Mick's bikes had M.P. forks. I made a few mod's to my bike, square barrel & head & drilled holes in everything. Sam got a first class ,I got a second class & poor old Charlie got a broken collar bone. In the pictures of 196 were before & after. 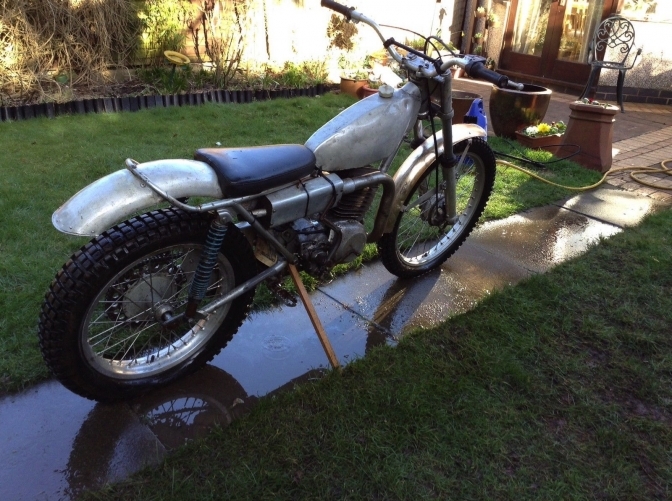 I sold my Elstar to Pete Robbins of Leamington Spa after swapping the forks back to BSA. 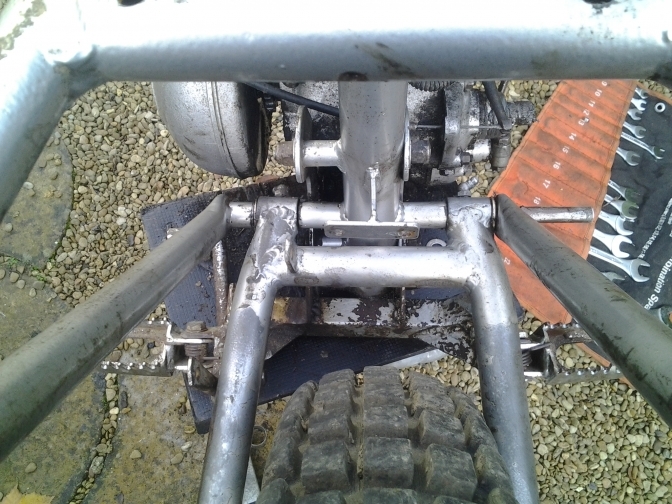 My frame cracked by the steering head, I made a new gusset plate & Sam welded it up. All our tanks were white, the cap was a plastic bung with an "O" ring. The Frames were blue as were the seats. 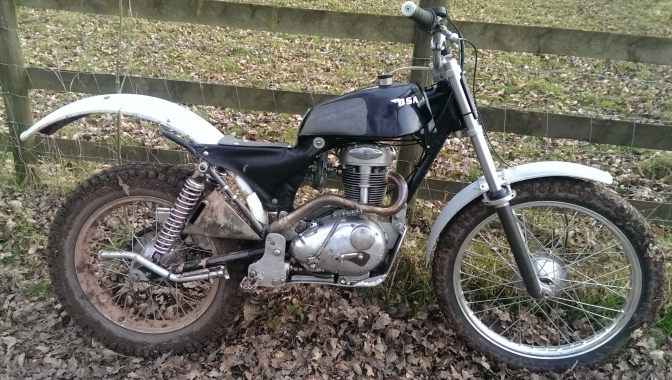 Steve Wilson,s bike with Triumph Cub motor was black frame & red tank. Mick Bennett who still lives in Wellesborne Warwickshire had some pic's of our bikes, we still exchange Christmas Cards. tank from a Dot Scrambler. If you know who now has my old bike & he is interested I have an old Tax Disc & some other photos. Charlie> There you go then Steve. I hope this is of some interest to someone, I've been back in NZ since 1975 & still play with old bikes. 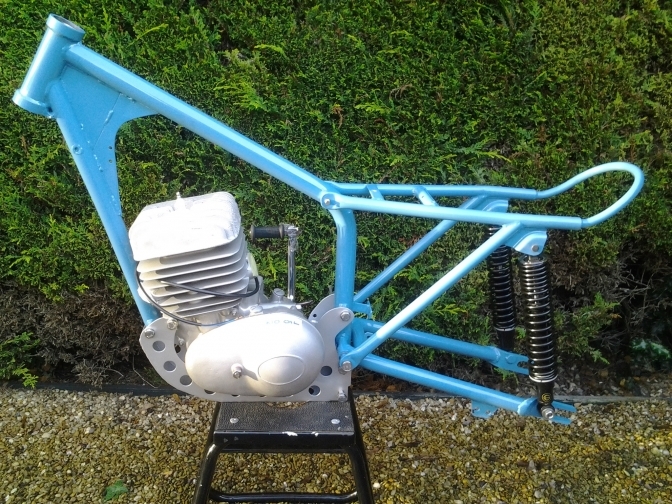 Bob has his motor back into the frame and the frame is now a shade of Nutley Blue. And by Six oclock on the 15/12/2017. Bob has now pressed on with the rebuild,and we have the proof below. Just like the bike I remember. Great job Bob. Up and running next year. I just thought I'd let everyone who has contributed to the Elstar project know what info has been gathered so far, as you know the main talking point has been what colour scheme the bikes were originally supplied in, i have been holding off painting my bike as there was so many conflicting pictures and articles around. 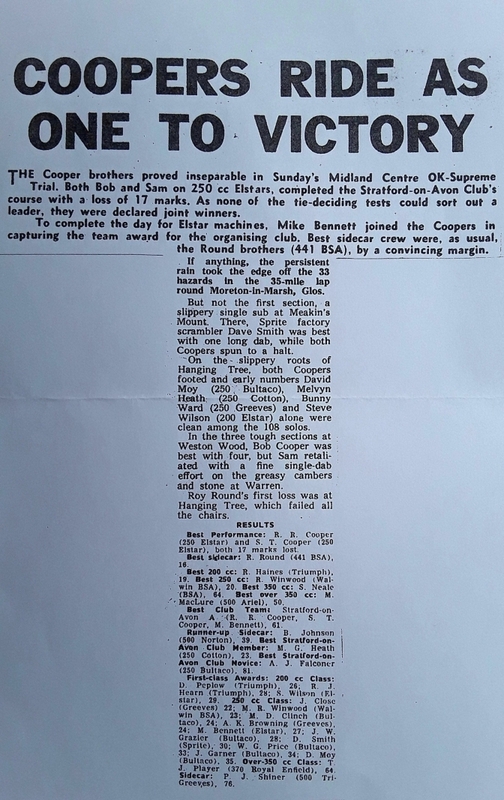 But since Roger got in contact, the only person to have a direct link with Alf Ellis as he purchased the kit new from him, confirmed that the frame was pale blue with a white tank, he also confirmed that Bob and Sam Coopers bikes along with Micks bike were all identical, this is what Charlie said right from the start, as he saw Sam Coopers bike in the 1967 SSDT, that bike was slightly different as Sam had fitted a Dot tank, Charlie says this was also blue. So with all this information I decided to paint the frame blue, I had alook through the old BSA colours and the only one that comes close is Nutley Blue, I had a chat with Mick and he thought that it was about right, I went to the BSA colours, as Alf used a lot of BSA parts in his bikes, so why not use its paint. I looked all over my frame for traces of blue, but found nothing, Steve let me have a piece of his frame with traces of pale blue paint on it ( I've attached a pic of it ) so today I was getting the frame ready to go to the blasters, there was some grease around,and down inside the headstock, low and behold under the grease overs spray, and it was light blue!. So this is the colour you want for your frames boys. 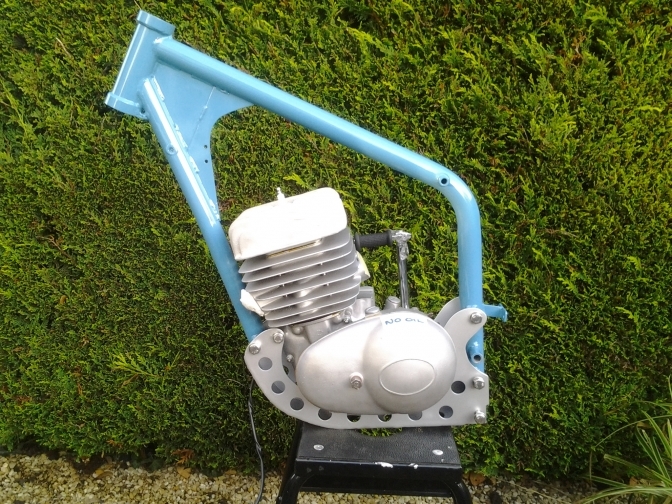 We now have these photos below of the bike Bob Pearce is rebuilding to Original Specification ,and Bob I have just retrieved a email from Pat Slinn No less, sent to me in 2009,that says and I quote. Photo Courtesy Bob Pearce and his bike. So your, and my theory that the colour of the machines could have been BSA Nutley Blue, seems to now ring true, as Alf must have been at BSA quite a Lot, and It was Pat "Quote" "I had to tart up a bike for BSA Incorporated in the USA to try and stop the invading flow of Japanese machines, this was painted in "Nutley" Blue." I replied, "I dont think that worked then Pat". So Bob. I will speak to Pat for conformation or at least see what he says? 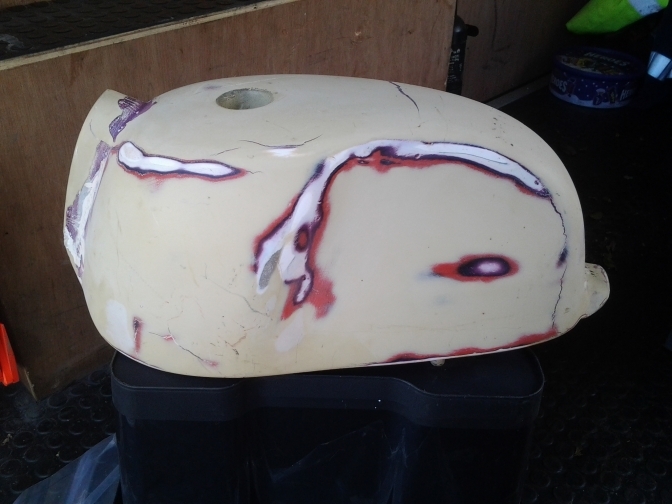 Below is Steve's ELstar.fuel Tank that Steve and Bob are going to get recreated, for their Bikes. The theory is that this Glass-Fibre tank had a bottle stopper type fuel tank cap? "unless anyone knows any different"? Charlie> We Now know the tanks were White, and the frames Blue. Thanks Roger. 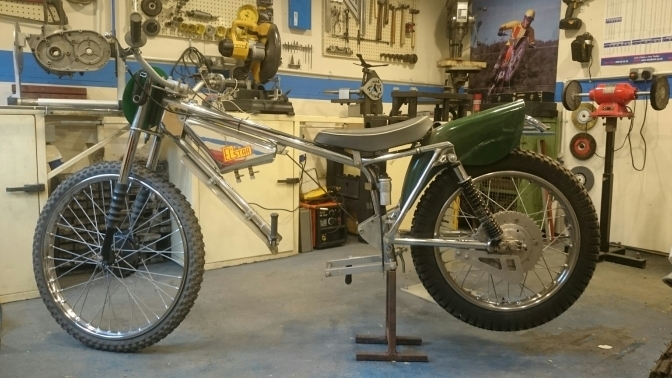 I know I said somewhere on this page that the trials bikes were a lot like the Grass bikes in construction, well this bike photo that John Dodsworth has sent me proves just that. 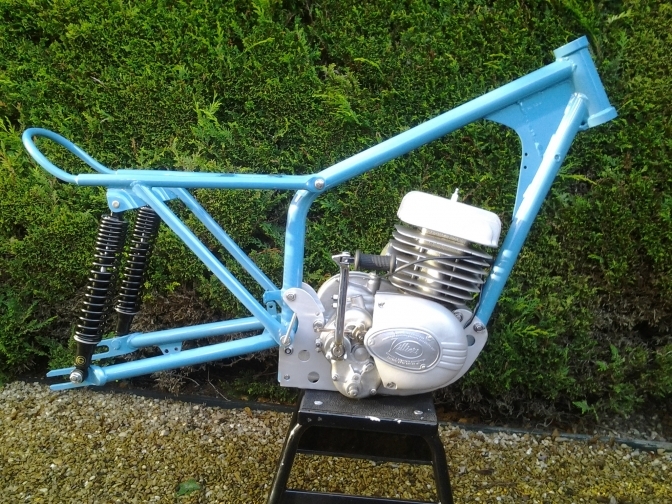 Hi Charlie I have this hybrid BSA C15 trials, built on Elstar grasstrack frame by Rob Greenhough and runs a Pete Kirby 330 special motor, not a factory build but interesting creation. 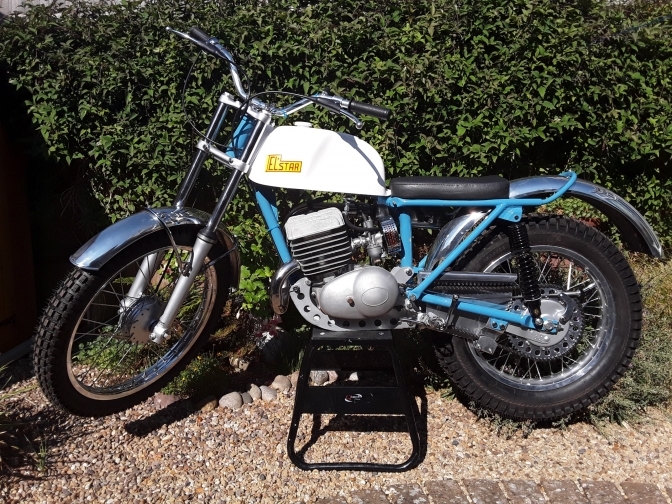 And regarding the Villiers Elstar trials bike that you have on the page, I stood next to the bike while it was sold, I was a couple hundred pounds short ! Still kicking myself now, can't buy them all Though! Part Two of the Story. 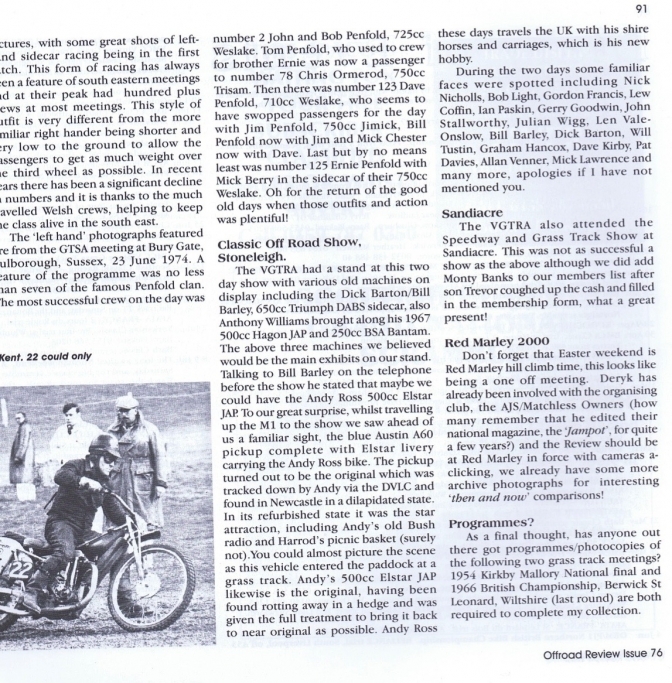 Scan Courtesy of Deryk Wylde "Offroad Review". Andy Ross was another owner of Elstar Motorcycles, that came to a tragic death in a shooting accident in 2006, after becoming a very successful businessman, after selling Elstar. 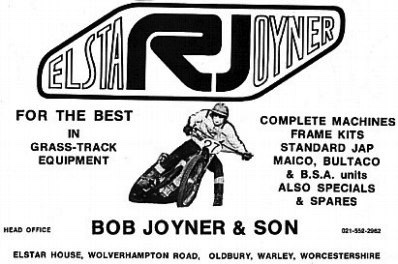 The remains of the ELstar company was eventually bought by Bob Joyner,a motorcycle entrepreneur who then set up his own Speedway and Grass-track team to develop the brand further for a while. 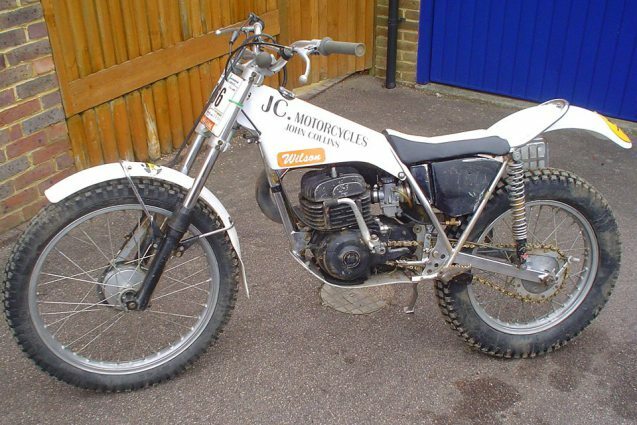 Riding for him at the time was the late Rob Hommer who had already been building his own speedway and grass-track frames so you would think that he had some input into the RJ ELstar's. 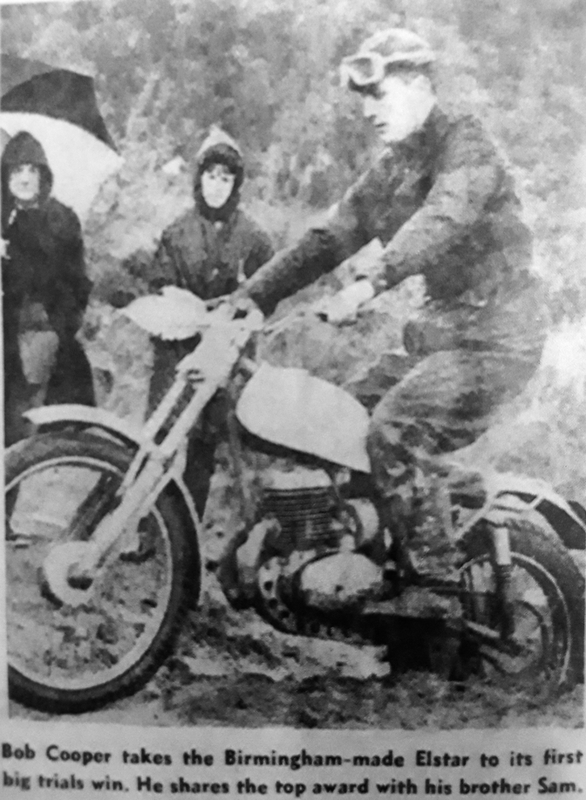 Other prominent ELstar Trials riders were Mick Bennett and Steve Wilson from the Stratford upon Avon Club. Nick Holt from Nene Valley, and I seem to remember Bunny Ward and even "Jonah" riding one at sometime. 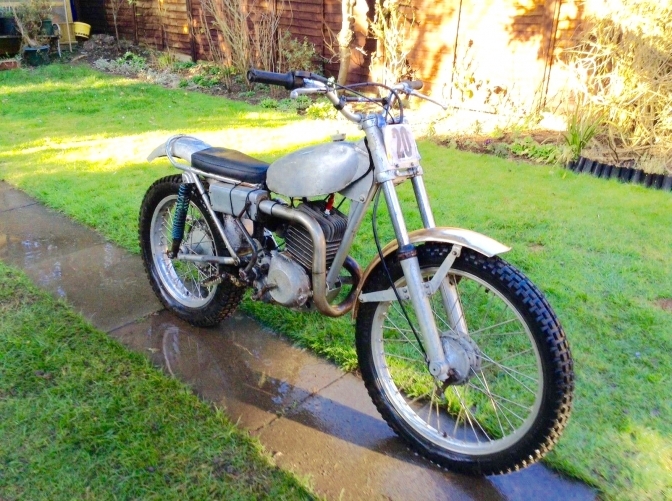 And Photos of any Elstar trials bikes are few. But luckily here is a bike that was living in the right area Coventry in the West Midlands, before it got sold recently. We would like to know where it is now living. Update.We Now have a name of the New Owner Bob Pearce, read below. Here you can see that it has the right rear wheel plates to make it genuine. I wonder if the owner knew how rare these ELstar's are? And he had ridden it for eleven years, before putting it up for sale. 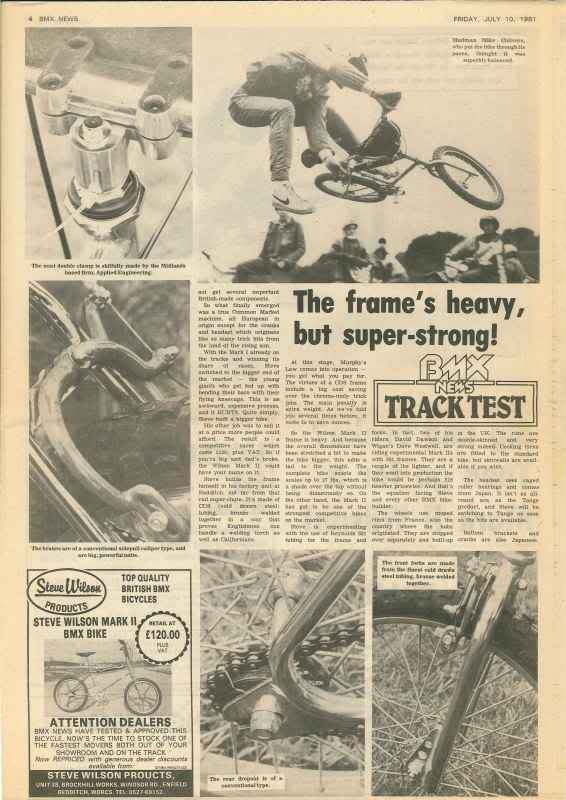 You can see from this shot (and I will find a better one) of the bike that the construction of the trials frames were very much like the Grass-Track bikes. 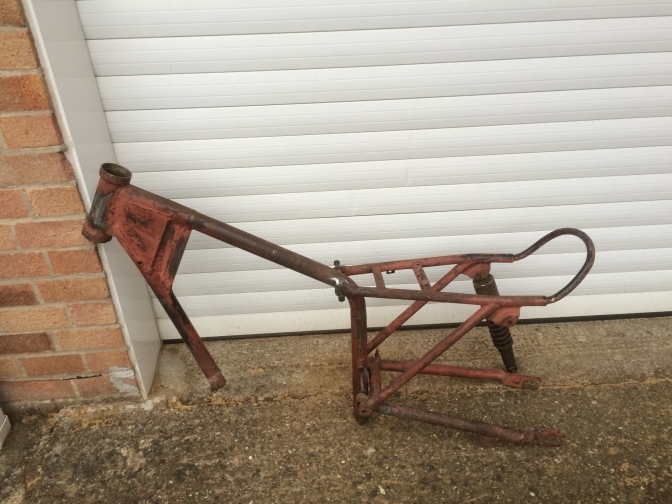 The swinging arm was virtually the same although it may have been a different length. Here is two shots of Steve's Grass bike that he sent me on 27/11/2016. And this shows clearly the make up of the ELstar frames. The rear subframe was also bolt on in the same manner. 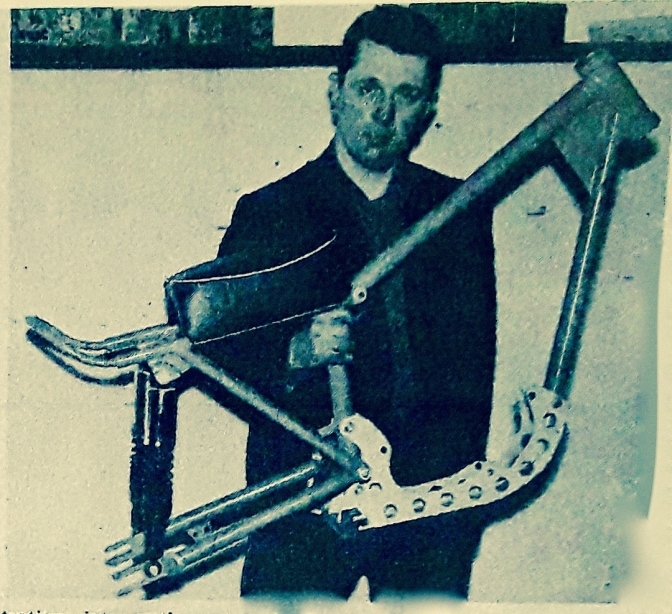 The main tank-seat tube bend, was virtually the same, only modified to give the correct dimensions for the trials frame. And even the pick-up point for the swinging arm was very similar although it would have been in a different position on the tube than the Grass track bike. And has you know the bike handled and found grip like no other similar machine. Bob Cooper an ex Works James rider said so, although he was using his Villiers engine from the James, but it had got to be the layout of the machine that made the difference. The bike above seems to have a longer than normal steering front tube reinforcing gusset plate, so perhaps after a couple of cracked front engine tubes, the longer length of this plate helped dissipate the hi-frequency vibrations that cause this sort of problem. And this bike has been ridden for eleven years by this owner so it must have worked. 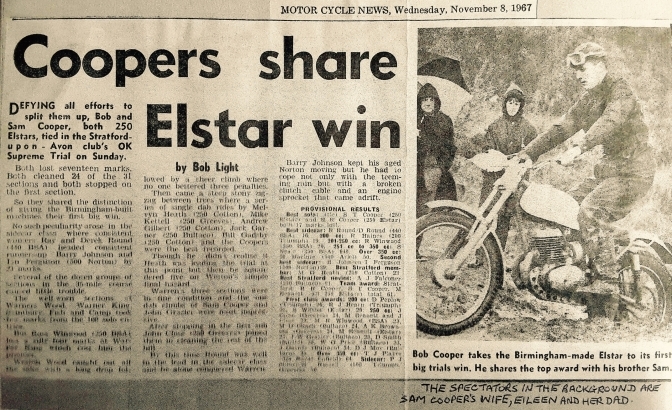 Also look at the BSA type rear shock top mountings I remember these on the first ELstar bike that Bob Cooper rode. 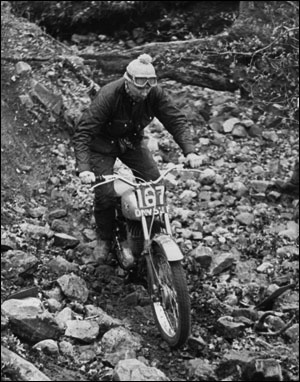 This is Nick Holt riding what I think is the ELstar that he owned, in the late sixties. One thing I do remember that the machines were blue the same as this text. Another small and for once thriving British motorcycle company that was stopped in its tracks by the tragic death of its talented owner . But would it have lasted any longer when the supply of Villiers engines dried up to the trade. First Mail from Bob Pearce. I to was a little surprised that he wanted to sell it, and although I had to pay what I thought was a fair price, the expression " Hens Teeth " come to mind. 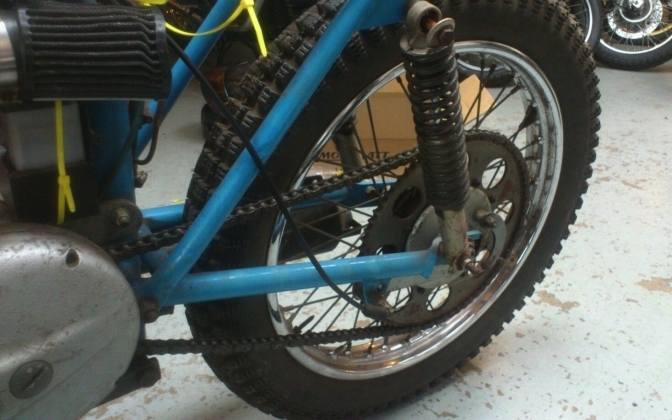 The bike its self is in quite a bad state and will require a full rebuild, but it is running, started it up today! The frame number is EL108 , I have the green log book, the original reg No was KOP 23F, the first date that it was licensed was ,27th July 1967 to a Robert Hastwell, first change of ownership was 2nd May1968 to John Sutton, it was not taxed again until 18 Nov 1971 again to John Sutton. I'm not that well up on midland riders, do those names mean anything to you? 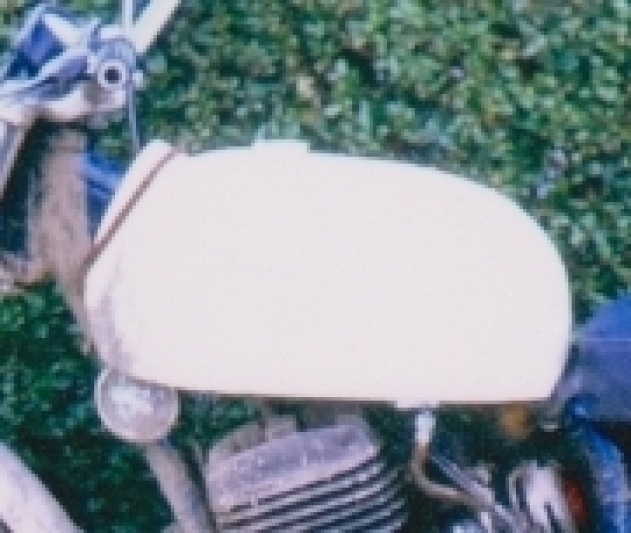 In your article you say that the bikes were blue, did this include the tank?, the log book says it was blue as well. Charlie.>Bob as far as I remember the bikes were all Blue including the Ceriani fork legs, but these were the so called "Works" bikes. and some of the Grass bikes had silver frames and some were plated. 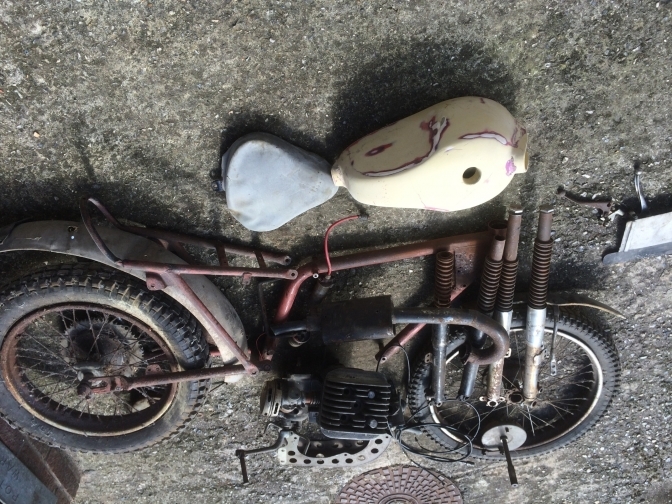 The tank is not original and is from a Beamish Suzuki, its going to be very had to find an original one to copy. Charlie> I am looking into the tank shape for you , I seem to remember they were quite angular. and Blue. I hope this sheds a little more light on the bike, and I look forward to updates on your excellent site. Thanks Bob, Now we have something to work from you never know where more information may come from. I was told Steve Wilson went to live in Cornwall does anyone know him down there? 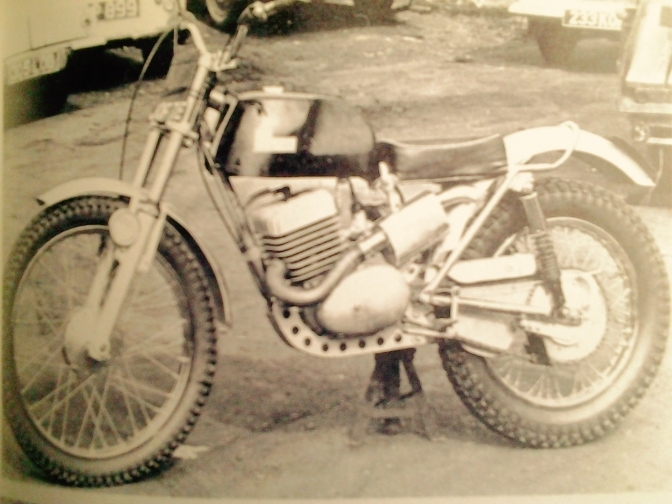 This was after a career of frame building not only trials bikes mostly with Bultaco engines. 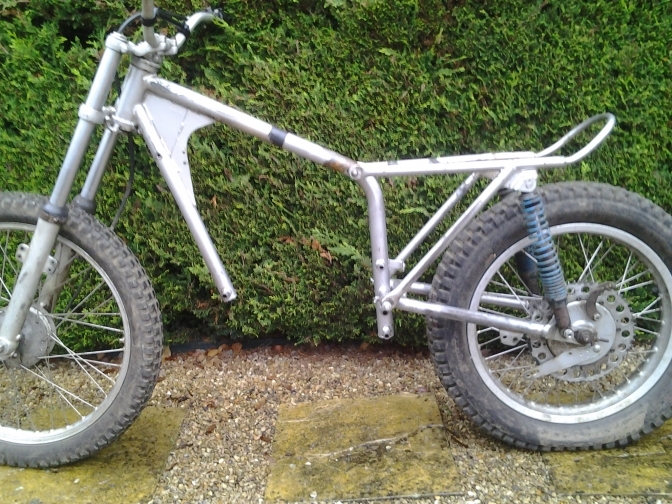 But then to move on to building BMX frames firstly for the Halfords team of the early eighties. but also in his own rite Steve Wilson Products of Redditch. Photo Courtesy John Collins Motorcycles. Here is one of the Steve Wilson frames. 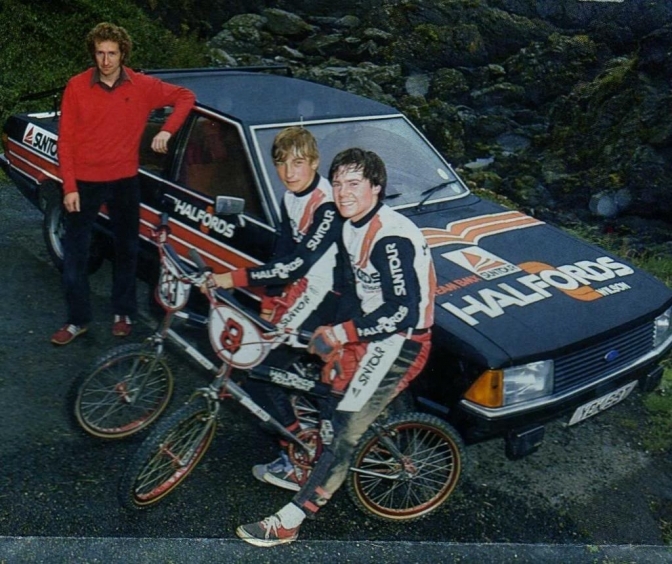 Here is Steve Wilson and two of the Halfords Wilson BMX team of the early eighties. Test and advert, Big Question is, did Steve help build the ELstar frames? 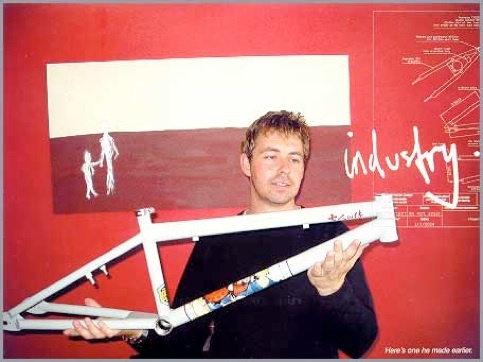 Lee Prescott.. a bit later with one of his "Hidden-Nation" BMX frames. What goes around,comes around, Lee is back making frames again now. 2016. And I am still playing with trials frames. Just. I have read some of the "Off Road Review" "Reference Library" for some of the information here. So Deryk what you set out to achieve in the first place has worked! With me anyway. Deryk tells me today 04/12/2016. that Chris Baybutt was the main grass track rider for Elstar and this kept them very busy with maintenance of these bikes. Photo Courtesy Don Morley. 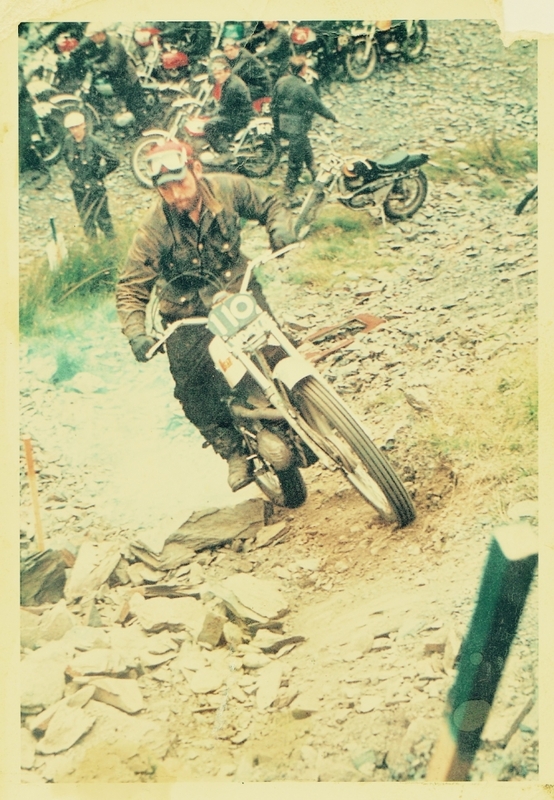 Scanned from Classic British TS trials bikes. Gary Westwood, as just sent me this message, we keep finding information don't we. And I had been told that this machine had a red tank. 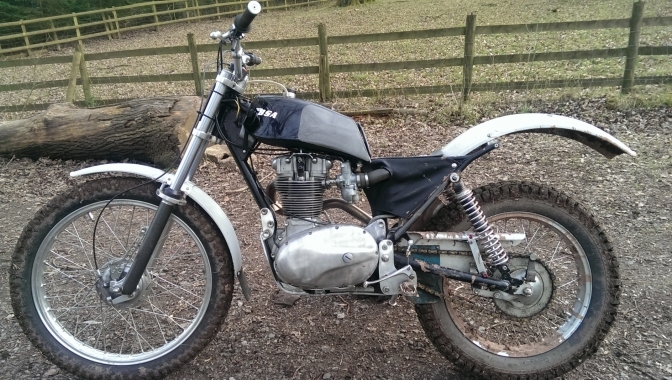 I think the last picture of an Elstar trials bike is one I used to own in the early 1970's. 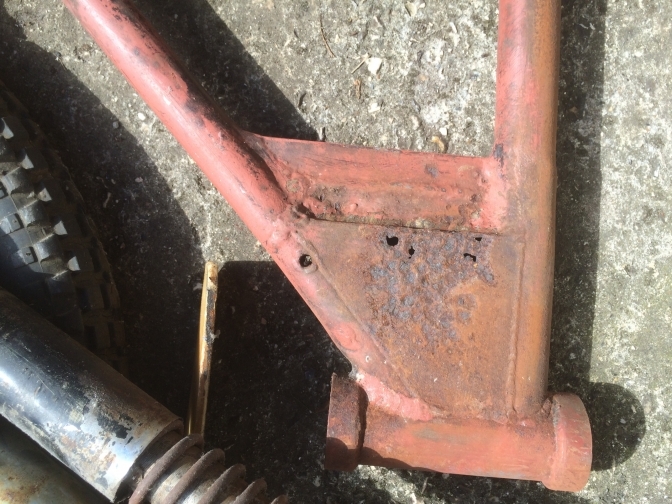 It had a red tank and a nickel plated frame which broke in half where the bolt went through the front frame tube. The engine was a Villiers 36A not the usual 37A with the heavier flywheel. This is how Bob wants to rebuild his bike. Silencer is Peco still available I am told from the same family that made the originals. The exhaust system is very mush a copy of a Sprite at the time, but with a bit better front bend. I only remember the frames being Blue to but the production frames may have been silver or even plated as were some of the grass bikes. Any information you can throw at the subject would be great. Deryk is still looking through his "ORR "Archives" for photos he knows he has. OK Big Big Breakthrough, Looks like we could have found the Sam Cooper Scottish frame of 1966? or did they all break at the front tube flitch plate junction? Steve now has his frame repaired and is ready for sand blasting and powder coat ,in Nutley Blue Steve? Steve is also having the Glass fibre tank recreated and he now knows the colour is white. well Steve Robbins has this ELstar bike with just that set of forks. Just look at where the frame has been repaired! I am going to do a bit more of an investigation now. 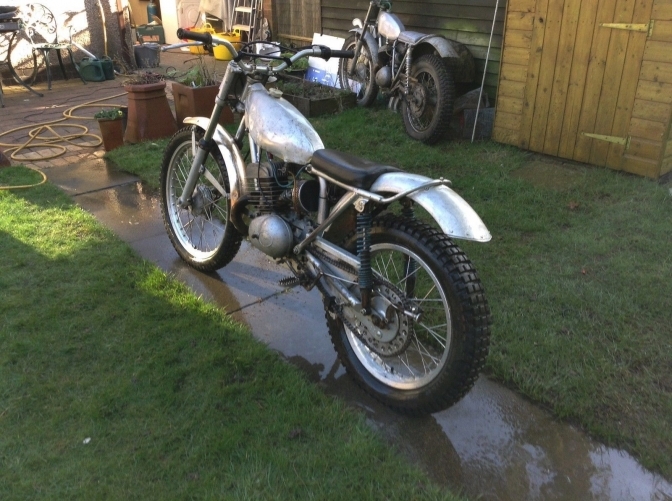 And I have had a mail from a guy that says he built the last batch of trials bikes in a shed behind Alf's house after his demise. John Dodsworth has just sent me a very interesting machine he has found. 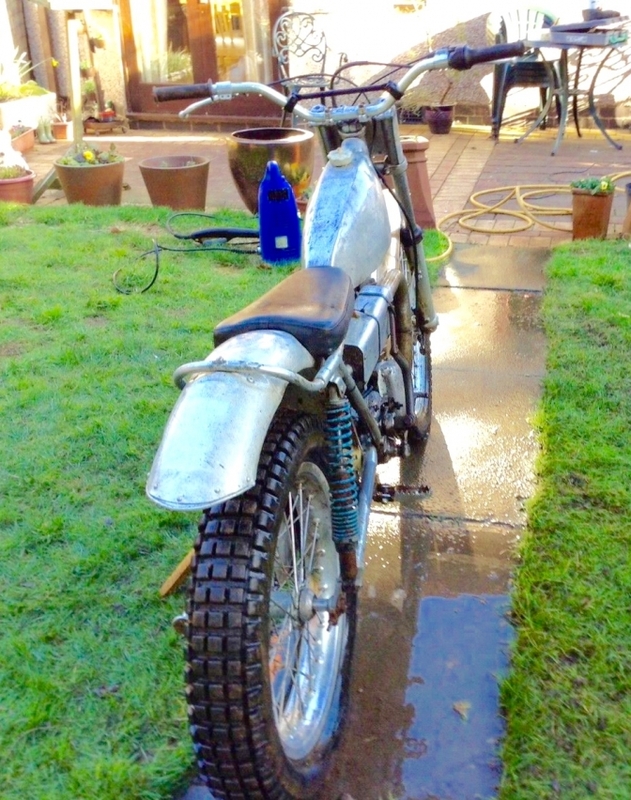 Another interesting bike to add to the Elstar page. 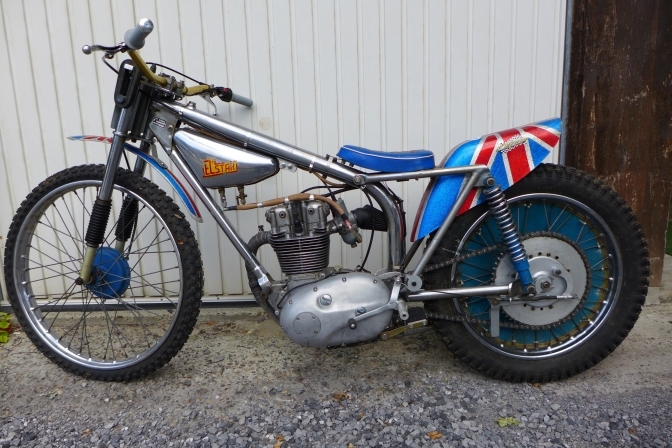 Built by Bob Greenhoff, A BSA C15 Elstar grasstrack frame, converted for trials,fitted with Pete Kirby 330cc BSA motor, still retains low rear subframe and top frame tube, makes interesting bike to ride ! More Later. as we find more information. And we keep getting NEW.